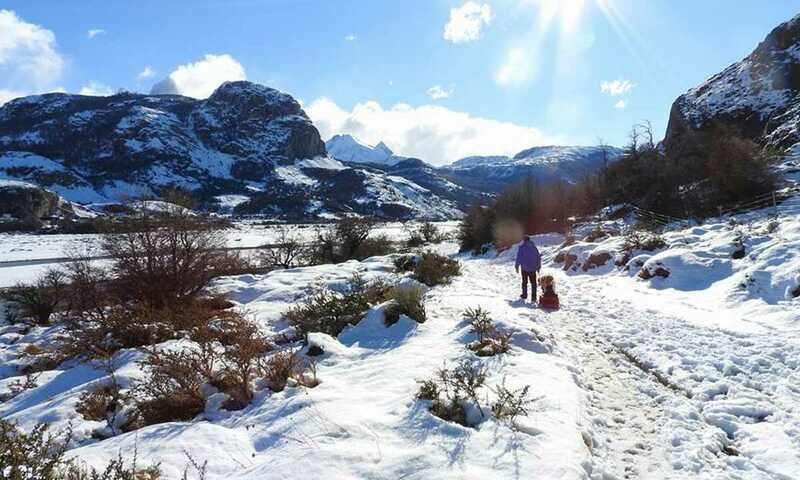 Hike the 3 main trails in El Chalten in Winter. With far less crowds than summer, you can enjoy the peacefulness and tranquility of the mountains all for yourself. Prepare to hike in snowy conditions, possibly with snow shoes. On arrival at El Calafate airport, a transfer will be waiting to take you straight to your hotel in El Calafate. Free afternoon or evening to enjoy at your leisure. We leave El Calafate at 8.00am, the distance to the glacier Perito Moreno is of 80 km, stopping from time to time to take photographs. 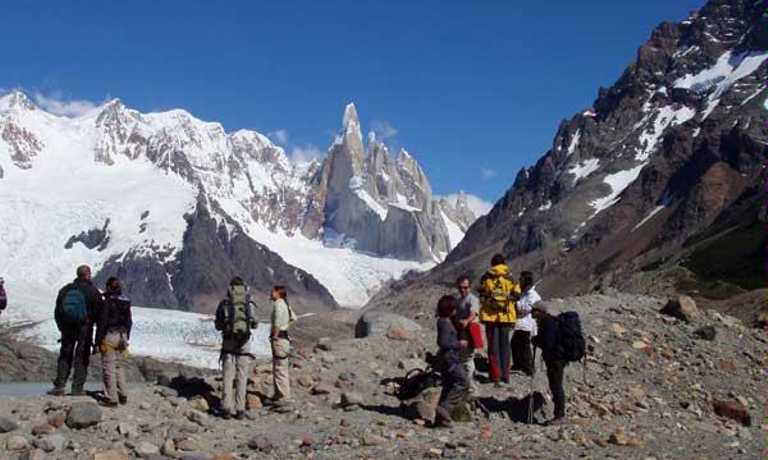 A guide approved by the National Park “Los Glaciares” will give you all the information about the surroundings, the history and the myth of this unique glacier. After entering the zone of Patagonian woods, we will stop in the curve of the sighs to enjoy the first view of Glacier Perito Moreno. We will continue towards the footbridge of this glacier where you will have enough time to walk along the footbridge in front of the glacier and enjoy the magnificent view. Meet at the bus station in El Calafate and take the 8am public bus to El Chalten (2.5 hours). Drop off luggage at your hotel in El Chalten and begin the hike along the trail which takes us to Laguna Capri, where we have excellent views of the Fitz-Roy mountain range. Here, we leave our sleeping gear before continuing through Lenga (Southern Beech) forest and ascend to the Laguna de los Tres. At this lagoon we enjoy the closest, and best, views of the massif before returning to camp. After breakfast you make your way into the beautiful Valley of the Madre and Hija lagoons, which then leads us to the Cerro Torre valley. The trail is beautiful and gentle with some up and downs with changing views to the surrounding mountains. Once we get to the camp we can take a break, have a cup of tea, enjoy the peaceful place before continuing on to the Maestri Viewpoint, where the legendary climber used to eye-up his climb of the Cerro Torre in the 50s. From here we can see the Cerro Torre and the Grande glacier from above in all its length. Then we return to El Chalten for a well-earned sleep in your hotel. We leave El Chalten on the footpath that heads towards Laguna Toro. Having walked for about an hour in ascent and crossed over small streams and through some nires and lengas woods, we arrive at an exposed area with a picture postcard view of Mount Fitz Roy, Torre and Huemul. 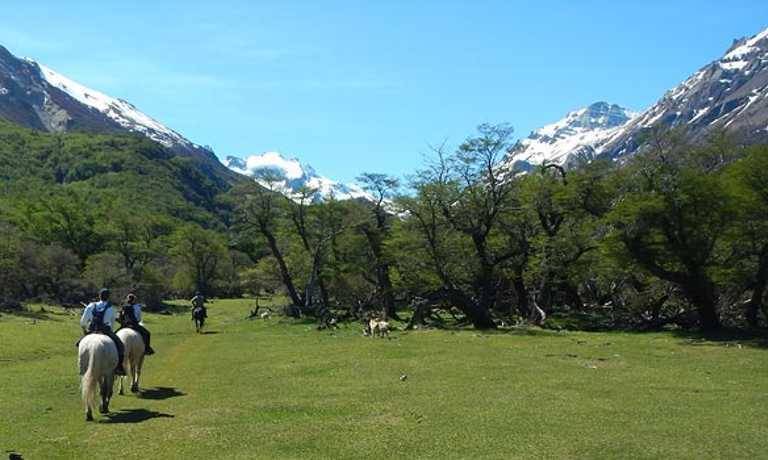 We continue the hike across the Pampas, locally called "Pampa de las Carretas". Then, we pass through various parts of the woods. On leaving the forest (about 1000m) we start to walk across an alpine terrain, where delicate flowers growing in such an arid area won't fail to surprise us. In this section it is quite possible to find the remains of marine fossils such as ammonites and belemnites which are about 100 million years old. We finally arrive at the viewpoint - nearly at 1500m. This spot offers an unconventional and unique view of the Torre and Fitz Roy massifs. After enjoying lunch with an unforgettable vista we return to El Chalten. Meet at the bus station for an 8am bus back to El Calafate. Taxi to airport and continue onward journey. This trip can run as a group trip, with prices starting from $975 per person for a complete group. If you are looking to join a group or you are a solo traveller we will help to form likeminded groups of travellers. Please let us know your travel plans. Night in organized camp with cooking assistant, dining tent, full camping equipment (tent, mat, sleeping bag) in double base and all meals.